With four genera containing 11 species. Historically treated as a subfamily of Cucujidae included within a single genus; Laemophloeus. The beetles of this family are probably all carniverous living on other insect larvae. Many are found under dead bark of mainly broadleaved trees and some are syanthropic and occur in stored foods mainly rice or grain. Laemophloeus contains one species; L. monilis (Fab. 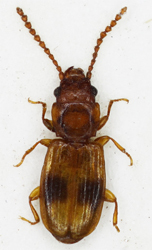 ), a small chestnut coloured beetle with an elongated darker spot on each elytron found under bark. The seven species of Cryptolestes are a mixture of wild bark species and domestic stored product species, several of which are non-native introductions. Notolaemus unifasciatus (Latreille) is found under bark. Leptophloeus contains two species; the native L. clematidis (Erichson) is found on Traveller's Joy (Fowler) whilst L. janeti (Grouvelle) is an occassional import from Africa and associated with stored products.